Afghanistan, 2008. A Black Hawk helicopter carrying a senior CIA operative is shot down by a surface to air missile, its lone passenger taken hostage by a fanatical new insurgent group. Knowing this man holds information vital to the ongoing conflict, the CIA bring in Ryan Drake and his elite Shepherd team to find and rescue their lost operative. But nothing is what it seems, and within hours of arriving in the war-torn country, Drake and his team find themselves caught in a deadly conflict between a brutal terrorist warlord and the ruthless leader of a private military company. 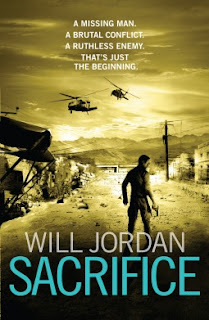 I like Will Jordan's writing, he supplies non stop action a great plot and characters that you root for. This book isn't even a book - it's a military action thriller,that feels like an action movie! It would be awesome, it has a high body count, exciting battles and villains that are ruthlessly cunning. This book was so surprising, Will Jordan is definitely an author to watch.